I can’t tell you how many times I hear people ask “what are the grippiest pedals out there?”. I agree that nothing beats the feel of a good platform pedal – but what makes it or kills it is the SHOE you’re using. No matter how grippy the pedal is, if you’re not using a shoe with a good proper sole the pedal won’t feel grippy.I’ve been wearing Five Ten Impact shoes for the past few years and can honestly say; if you use flat pedals, they are the best riding shoes money can buy. How grippy are the Five Ten Impact? I always tell people they are like Velcro when coming in contact with flat pedals – once your foot is planted on the pedal; you literally have to lift your foot off the pedal to reposition it. This might need some getting use to if you’ve been using regular shoes for riding, but once you get used to the grip – you will be addicted! Perfect for DH racing if you prefer the freedom of platforms – just feels like you’re clipped in. Needless to say, I was pretty bummed when 5.10 decided to discontinue their Impact shoe. Even if I babied my Impact’s - trying extend their life as much as possible, I knew they would eventually need to be replaced. That is when I decided to start hunting for new riding shoes. I tried Vans, Oakley, SixSixOne, etc… Although all mega comfortable and somewhat grippy, they all fell short when compared to the grip of the Impacts. 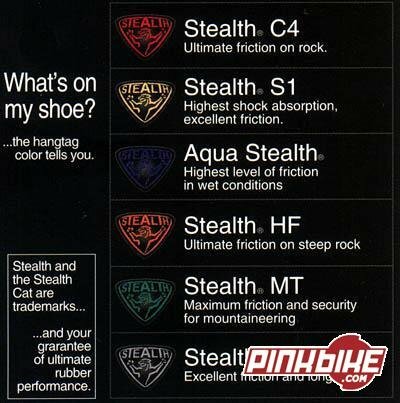 That is when I got in touch with Eric Odenthal of 5.10 – I was trying to find a place that offered resoling with their dotted Stealth C4 Rubber. He suggested I take a look at their Guide Tennie shoe. They did look nice, but considering the arch on the sole they probably wouldn’t be as stable as a good flat sole, like the Impacts. That’s when I brought up the Impact and told Eric they could make a killer if they brought back the impacts - it's almost ridiculous how many people were asking for them on various Mountain Biking forums. Eric decided to spread the word within the Five Ten headquarters – and the rest is history. The Five Ten Impacts are back for 2005 – and we can thank Eric for making it happen!! Finally I can retire my old 4 year old Impacts and get a new pair. 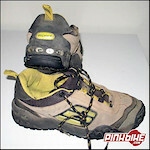 The 2005 Five Ten Impact comes in two flavors – High Top @ $89.95 US and a Low Top version @ $79.95 US. Not only are they using the same Stealth rubber sole as the old impacts, but the new shoe also comes in a stealthy black color. 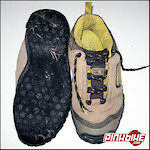 For those of you out there that currently own pre 2005 Five Ten Impacts – just a heads up that the new 2005 ones are more true to size when compared to the pre 2005 Impact. i.e. my old Impacts are 8.5, but had to get 9.5 for the new model, which is pretty much true to size, since that’s the size I wear for all other shoes. Want a pair? Call Five Ten’s customer service at 909.798.4222 to place your order. 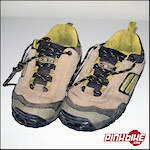 Again, big thanks to Eric for bringing back the best riding shoe!